Insights in Nutrition and Metabolism is a peer-reviewed, open-access scholarly journal focused on publishing articles in all aspects of Nutrition, Metabolism, and their related disorders. Additionally this journal aims to cover integrative fields of food, nutrients, food product development, food safety and benefit; food microbiology, food-borne pathogens, and fermentation; food engineering, functional food factor, nutritional biochemistry, nutritional physiology, molecular nutrition, molecular gastronomy, poor nutrition, balanced eating, novel ingredients and nutrigenomics, obesity, diabetes, clinical genetics and epidemiological studies that describe methodologies, mechanisms, and associations in metabolic relation to diabetes and nutrition-related diseases. It also implements integration of nutrition, exercise physiology, clinical investigations, and molecular and cellular biochemistry of metabolism. It is with profound pleasure I welcome readers to this inaugural issue for a new Journal “Insights in Nutrition and Metabolism”. 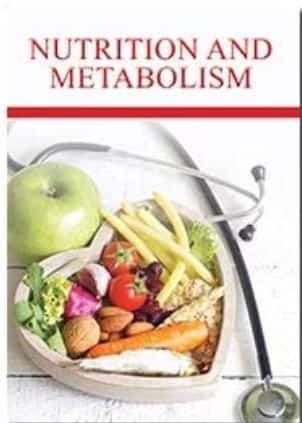 Insights in Nutrition and Metabolism is an Open Access, fully peer-reviewed, scientific journal providing rapid dissemination of research in all areas of food science, nutrition and metabolism and their related disorders. The journal provides an opportunity to share the information among the food, nutritional, medical scientists, researchers and students.It aims to publish most complete and reliable source of information on the discoveries and current developments in the mode of editorial, letter, case reports, short communications, original and review articles from leading scientists and scholars around the world in all areas of food, nutrition, biochemistry, physiology, pathology and medicine.Insight in Nutrition and Metabolism is making them freely available through online without any restrictions or any other subscriptions to researchers worldwide. This Journal is one of the best Open Access journals of Allied Academies. Insights in Nutrition and Metabolism is using Editorial Tracking System for quality in review process. Editorial Tracking is an online manuscript submission, review and tracking system. Review processing is performed through the editorial board members of the journal or outside experts; at least two reviewers approval followed by editor approval is required for acceptance of any citable manuscript. This is done in accord with the highest standards of professional ethics. Authors may submit manuscripts and track their progress through the system hopefully to publication.On behalf of the editorial board, I welcome readers to this journal. We look forward to your submissions and to publishing your research work. There is no doubt the journal will be interesting. I hope this Journal will contribute in the development for research of integrative biomedical fields concerning food, nutrition and metabolism with valuable information.The journal will also publish papers concerned with the benefits of nutrition and lifestyle interventions and therapeutic trials in diabetes or related diseases for both clinical disease management and health promotion. NOTE: Prior to submission authors should review the information contained on the journal’s About webpage, which contains important information on the journal’s aims and scope and accepted manuscript types. Authors should also verify that manuscripts meet the basic manuscript presentation requirements. Authors may find the sample manuscript and downloadable manuscript template helpful. Manuscripts submitted to the journal are subject to blind peer review by a minimum of three to four suitably qualified reviewers. Peer reviewers are drawn from the journal’s editorial board, its volunteer peer reviewer pool, and occasionally from Pubmed. All editorial decisions are the responsibility of Editor-in-Chief or a Deputy Editor-in-Chief or Associate Editor, where appointed by the Editor in Chief. Throughout the editorial and production processes the publisher proactively monitors each stage to prevent delays to authors. Authors are regularly informed of changes in their paper’s status. Editorial contributors, journal staff, and external contractors who contribute to editorial and production processes are qualified, experienced professionals chosen for their ability to efficiently contribute towards high-quality published papers. Article processing fees are clearly communicated to authors prior to and during manuscript submission and there are no additional fees based on use of color, figure or word-count. The journal offers significant benefits to authors including: Articles gain substantial visibility through an expanding selection of databases and indexes. Authors retain copyright in articles, which may be freely shared, reproduced, and archived. The journal is compliant with major open access policies, and contributes to leading archiving systems. Efficiency of processes results in fast publication without compromises in the quality of published papers. Editorial and production processes are designed and managed to provide high-quality results. The peer-review process is rigorous and constructive. Authors rate highly the quality of their interactions with the editorial contributors and journal staff.